This page is here just for you! Yep, that’s right. I want you to know why being a subscriber is a smart decision for you. 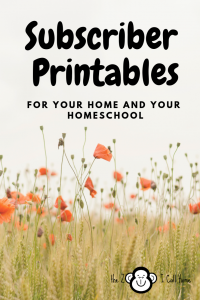 I totally understand that there are hundreds of homeschool blogs to read and be a part of, but I am so thankful that you have stopped at my humble abode! And to show my gratitude I offer free gifts and services to my special people! First and foremost is access to the freebie section of The Zoo I Call Home. Once you subscribe you will receive the password for this private area for subscribers only. Currently you will find a menu planning worksheet, time management cheat sheet, a goal setting page and more. Plus I’m always adding to this page, so be sure to check the weekly emails for updates. 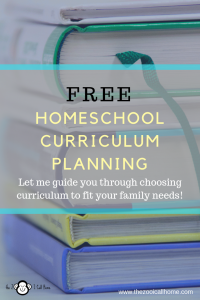 All my subscribers have free access to my curriculum planning service where I help you find curriculum that fits your family! Information for this service is in your initial welcome email. If you didn’t get this email or deleted it, please contact me and I can send you the information.